Tracks usually don't lie, and after so much searching me and my assistant had finally come upon what we were looking for: a line of footprints left by a small herd of Addax antelopes; the survivors of a group of few individuals reintroduced in the early 2000s to the Tunisian protected area we were in. The animas were again living “free” in their ancient habitat, albeit under close watch of rangers to prevent poaching from wiping them out again. The first reason why I was in the Grand Erg Oriental actually was to search of another endangered species, the Slender-horned gazelle or Rhim, but since I had notice of this small group of Addax existing nearby, I did not want to pass the chance for a possible first encounter with the species and so I took a short break from the main purpose of the trip. We kept following the antelope tracks until we could spot four white shapes on the horizon. 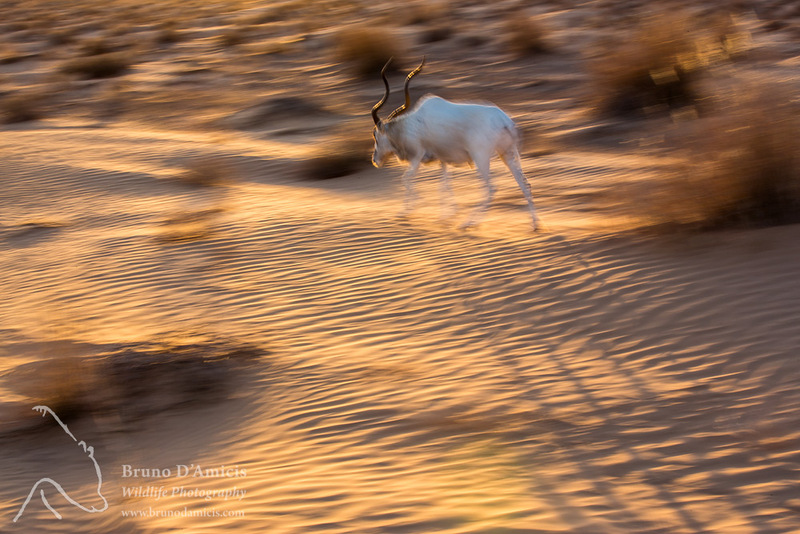 The Addax were slowly moving through the dunes, unwary of our presence. Being born in semi-captivity in another reserve in Morocco and after their reintroduction having been strictly protected, those animals did not perceive humans as a threat and seemed very obliging. Some two hundred meters before reaching them, my assistant stood and I went on alone. The antelopes briefly raised their heads from grazing, to return immediately to feed. I could approach them very close and started walking next to them, taking many pictures in the process. They were so beautiful with their white coat and the elegant dark design on the head; the long, twisted horns were shining in the fading light. I was very happy to have finally met this legendary animal up close and photograph it in its habitats. Eventually, when darkness came, I left the antelopes alone, moved by this beautiful encounter. The sight was great and the pictures not bad at all. Nevertheless, hours later I realized that this experience had left me with a bittersweet taste. Despite the aesthetical joy of watching a “wild” herd of Addax roaming free in the Sahara, I was not completely satisfied. By looking at the pictures on the rear of my camera I could not feel any of the vibrant emotions Dragesco's photograph had conveyed. My pictures lacked wildness and uncertainty. Although those animals were back to an area where they had been chased to extinction less than a century ago, they seemed out of place. And my succesful “adventure” did not have at all the taste of the real thing, but only of fake. If I wanted to feel accomplished, then I would have had to stick to my original plan and keep waiting for a window of opportunity to go to Niger. A couple years more had passed since that encounter in Tunisia but the chance to reach the last truly wild herd of Addax had not presented itself to me yet. Meanwhile, I had been in close touch with the scientists who, despite the critical political situation, were still carrying out annual aerial surveys of the antelopes in Niger and each time I waited anxiously for their reports. Where once were hundreds of thousands of Addax antelopes roaming the whole Sahara, from the Atlantic coast to Egypt, now less than two hundred animals seemed to have survived just in a certain area in South-East Niger. An area where international conservation NGOs had helped Niger's government creating a large national park, to ensure the survival of those last antelopes. Besides the wild popultaion, one could theoretically count also on a "reservoir" of some hundreds individuals surviving in enclosures, zoos or other fenced areas across the world. The situation for the wild herd was undoubtedly very critical, but it seemed stable at least and there was some hope, for the animals to survive and also... for me to visit them one day! Yet even this little optimism was not bound to last too long. In the spring of 2016 some shocking news revealed that, despite some great effort, the latest scientific survey carried out in Niger had produced just an observation of 3 (!) frightened Addax antelopes. In their report the organization was quite clear on the reason for this sudden decline, blaming the poaching carried out by soldiers employed to protect Chinese-owned oil installations. In a place where years of political uncertainty have created a hotspot for drug smuggling, weapon traffic and wildlife trade the existance of a national park wasn't probably enough of an obstacle to stop criminal activities. While these sad news did not come as a surprise, they are of serious concern as they mean the probable extinction of this magnificent species in the wild. At this point it is very unlikely that I will ever be able to observe these animals in the Sahara. But what hurts me the most is not the impossibility to fulfill my longlasting dream, it is rather the complete lack of general awareness surrounding this issue. Ask around and see how many people know about the situation of the Addax antelope or any other endangered Saharan species: simply nobody does. In the Sahara and Sahel we are witnessing one of the greatest environmental devastations of all times and almost noone is talking about it. It is indeed very sad. But, on the other hand, what can one expect? If even the largest and longest-lasting conservation and media campaigns haven't managed to ensure a certain future to rhinos and elephants, how could a small team of field scientists and a handful of blurred pictures help raise awareness about the disappearance of the Sahara's most charismatic wildlife? It is always painfully difficult to manage one's anger when it comes about a species becoming extinct, a natural place being destroyed. Yet, this time and for all the reasons I am here writing about, the acceptance of what is going on in Niger is extremely hard for me. This is why I have dared to disturb and bring in movie director Darren Aronofsky and his weird movie “Requiem for a dream” because it seemed the perfect title to me for this article. Yes, let the dreams rest in peace. My own dreams and those of all the people who are working hard to save this doomed animal! Sadly, this won't be the last species we are going to lose in the near future. With each disappearing animal, plant or place we also lose a chunk of our imagination and our freedom. As this process goes on, the world becomes smaller and smaller and I wonder what will be left to our and the next generations of nature enthusiasts and photographers. Technology can surely help us in making it easier to get great shots, cheaper airplane fares will make us all reach the remotest places, but I wonder of what avail will all the megapixels of newer cameras be one day without the basic dreams to drive our fantasy?